A gorgeous villa in Finca style built in 2004 and located in the peaceful countryside of Benissa, The living area spans 300m2 situated on a flat plot of 13.700m2. The house covers two floors. The accommodation includes:- on the upstairs level :-two bedrooms with fitted wardrobes, bathroom and lounge. The ground floor has the master bedroom, bathroom, guest toilet, kitchen and living/dining room both with access to the covered terrace. There is a garage with direct access to the house, also a pergola for two cars. 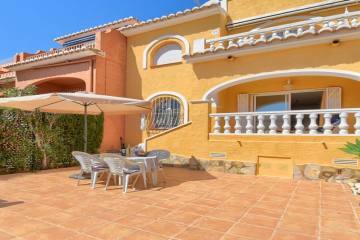 Extras include:- underfloor heating, pool with self-cleaning, climalit windows.